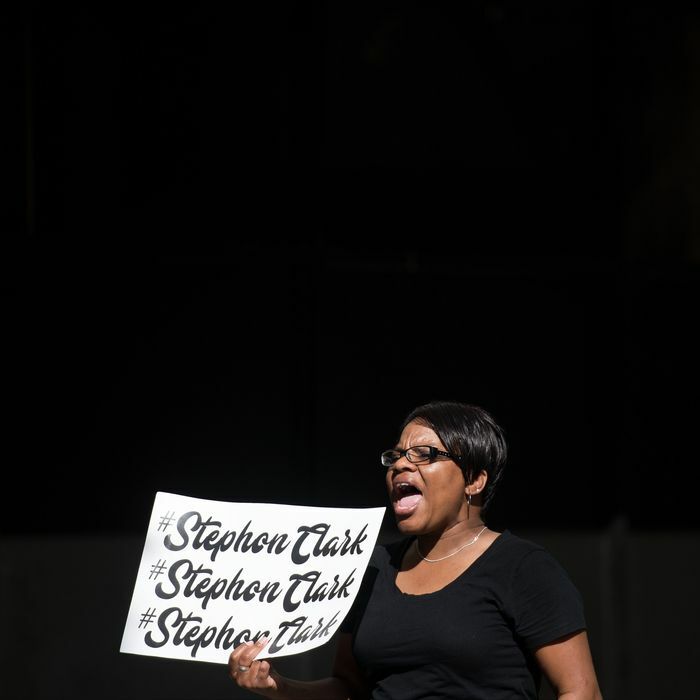 Black Lives Matter protesters show their support for Stephon Clark on the day of his funeral in front of the Sacramento District Attorney’s Office. On March 18, Stephon Clark’s life was brutally taken by police officers in his grandmother’s backyard. Body-cam footage shows police, who were responding to a report of break-ins in the neighborhood, opening fire seconds after one of the officers yells, “gun!” All that was found on Clark’s lifeless body, however, was an iPhone. According to acclaimed forensic pathologist Bennet Omalu (known for his work in discovering CTE in deceased football players), who was hired by the Clark family for a private autopsy, eight of the 20 bullets the officers fired hit Clark, six of them from behind. Four bullets struck Clark in the back, two struck him in the neck, and one each in the armpit and thigh. The gunfire pierced Clark’s lung and shattered bones into “tiny bits.” It took him between three and ten minutes to die. This violent assault not only robbed him of his life, but also his family’s ability to execute a proper faith-based burial for him as a Black Muslim. In the Islamic faith, as with all Abrahamic religions, death is not viewed as the cessation of life, but merely the end of a soul’s existence on Earth; the holy Quran describes in detail the process by which they are resurrected and transported into the afterlife for judgment. In reverence of this transition, a thorough and austere burial ritual is performed to prepare the deceased’s body, following four steps: (1) the cleansing ritual (ghusl), (2) enshrouding the body in an unadorned white cloth (kafan), (3) a funeral prayer (Janazah), which is distinguished by supplications for the deceased and wishes for a peaceful transition into their next phase of existence, and (4) burial, with the departed’s head pointing toward the holy city of Mecca. All four steps are expected to be completed in as close to 24 hours as possible — or in the case where someone passes under suspicious circumstances, immediately after the cause of death is determined — and, in the case of possession of the physical body, are considered prerequisites for the person to enter Jannah (heaven). In Clark’s case, the process took 11 days before commencing, due to the time between both the coroner’s examination and the secondary private autopsy. A Black Muslim’s untimely death at the hands of a battery of bullets from law enforcement is not a 2018 anomaly: Amadou Diallo infamously met the same fate in the Soundview neighborhood of the Bronx just over 19 years ago. Instead of a cell phone, it was his wallet, and it was his own house versus that of his grandmother’s, but the sequence remains the same: The victim was misidentified as a suspect, an officer yelled “gun,” and each man died in a hail of bullets. It took two weeks for Diallo to have his proper burial in Guinea. All that remains to be seen is if the cycle will be completed with the acquittal of the police officers responsible for Clark’s death. Black Muslims are used to being overlooked as members of Muslim diaspora, as well as one of the largest growing demographics of the American Muslim population. In the week after his passing, few publications mentioned Clark’s faith in describing his legacy. But in a country in which justice is far from guaranteed in a black person’s earthly life, we still possess faith; whether that be in a higher being, in our communities, or in the institutions that are pledged to uphold our civil rights. In the Black Muslim community, that last part isn’t always so cut and dry — the institutions ignore them and the communities are under constant surveillance, despite our perceived invisibility. What persists is belief in the holy Quran and the hadiths adjacent to it, and that adherence to these mores and traditions will aid in entering Jannah in the afterlife. This faith, that repeated injustices on Earth will be washed away in the afterlife by salvation and liberation endures, despite repeated infringements on freedom. But acts like this massacre, which not only end lives but violate victims’ faith practices, threaten to rob people of that conviction. If we seek to do these victims justice by honoring their lives, it is our duty to embrace their whole identity as the bullets try to strip them away.